First Presbyterian Church was established in 1784 when the area was still part of the Town of Southeast in Dutchess County. The church filed incorporation papers with the State of New York in 1806 . This congregation is affiliated with the Presbyterian Church, USA, and is a part of the Synod of the Northeast and the Presbytery of the Hudson River. 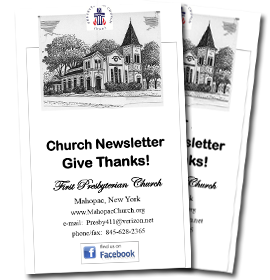 Click the link below to see the latest First Presbyterian Church newsletter.